Customers and staff of a seaside café in East Preston were left amazed when a Harry Potter actor popped in for a slice of cake and cup of tea. Sitting in the glorious September sunshine, Guy Henry, who appeared in part one and part two of Harry Potter and the Deathly Hallows as character, Pius Thicknesse, paid a visit to The Seahorse Café, in Sea Road, last Wednesday. Head chef Darren Hendy, who has worked at the café a year, spotted the star and took the opportunity to grab a ‘selfie’ and autograph for his fiancée, Angela, who is a huge fan of the film series, which are based on the novels by author J.K. Rowling. He said: “It was a really nice surprise for the cafe and I had a great chat with him. 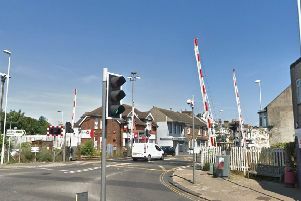 The stage and screen actor, who currently plays chief executive officer Henrik Hanssen, in Holby City, was on the south coast as he was picking customers up from some holiday homes in East Preston, to drive them back to Wimbledon. The actor, who is also known for his roles in television series’ Rome and John Adams, had a two-year break from the BBC drama and learned to drive buses and he told Mr Hendy that this is a side business he runs. It was a first time visit for the BBC celebrity and Mr Hendy said he ‘loved it’. “He said to me that he will be visiting again,” Mr Hendy added. This is not the first time the café has been a hotspot for celebrities as English actor, singer and broadcaster Michael Ball was seen there last month and radio DJ and television presenter Neil Fox has also paid a visit. Mr Hendy said he has been told by residents that parents of celebrities live in the area and this could be the reason why the cafe has had some surprising visits. The Seahorse Café is currently adding a modern twist, having recently changed its menu, adding a new daily specials board. The cafe has been a huge hit for customers in the area, taking in more money than ever before, Mr Hendy said. “The summer has been extremely busy and we would like to say thank you to all our loyal customers for making us so busy,” he added.